There are several coffee shops in the U.S. with the name Fika. Also, I have heard they use the word sometimes as a verb? "Would you like to Fika?" Is that true? WOW - I'm going to have to go have a cookie, coffee, chocolate, and a cinnamon roll. I think J&S is kind of like a Fika House. Great story, good pictures. That is a great tradition and a great way to spend more time with family and friends. Is Fika something you do every evening or just on special occasions? You mentioned substituting soda for coffee. Can you substitute tea for coffee as well? To answer Gran: Yes, you can use Fika as a verb, who taught you that?! :) Are you secretly hanging out with Swedish people. You can also say "would you like to take a Fika?" To answer dad: We have Fika mainly when we are with Fredriks family, and we do it everytime we eat together. 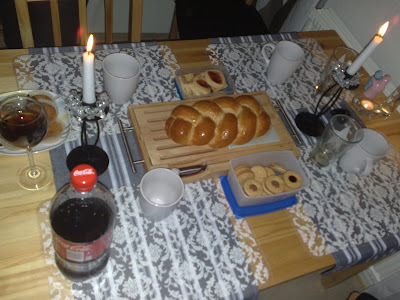 So we have breakfast, then a Fika sometime in the afternoon, dinner (usually around 5) and then another Fika. And yes, you can substitute tea for coffee, but in all honesty, I've never seen a Swede drink tea! They love love love their coffee! Thanks for the questions, it's fun to answer! Yes, I have met some Swedes! Actually a couple opened a coffee shop about 30 minutes from us. The woman is from Sweden. Their shop is called Fika. So I looked it up in the Urban Dictionary. We don't go there very often because it isn't handy, but I wish someone would open a coffee shop near us. Something like a J & S Fika Shop!! Thanks for all the info and fun photos! I love, love, love all this talk about J&S on Central European Time! I equally love the idea of sitting down to a feast of treats multiple times a day. I could pick up that tradition real quick. Yes, let's all do that sometime! I feel like I am a Swedish Adventure Groupie! I don't know if I can eat those candies, though. But Coffee and pastries and interesting people talking about Ashley's year in Sweden; now there's the ticket for me! I'm a Swede who loves fika so much I've googled for it (sometimes that's how people find my blog :) and ended up on this post. Hilarious! I feel very excentric now. Or actually, erm, perfectly normal! Fika on!